There has been a Significant Height Revision to a hill that now appears in the Double Sub-Twmpau list that accompanies the 30-99m Twmpau list, with the hill’s height and drop confirmed by analysis by Aled Williams of data produced by LIDAR. With the title of Twmpau being an acronym for thirty welsh metre prominences and upward. Accompanying each 100m height band within the main Twmpau list is a sub list entitled the Sub-Twmpau, with the Double Sub-Twmpau attached to the lower tier height band of Welsh hills. 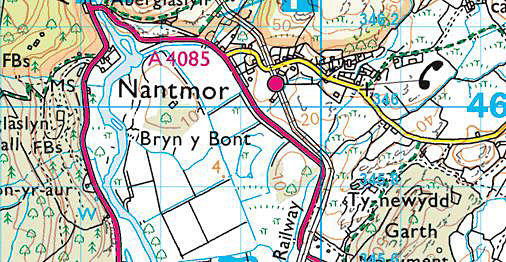 30-99m Twmpau – All Welsh hills at and above 30m and below 100m in height with 30m minimum drop. 30-99m Sub-Twmpau – All Welsh hills at and above 30m and below 100m in height with 20m or more and below 30m of drop. Double Sub-Twmpau – All Welsh hills at and above 20m and below 30m in height with 20m or more and below 30m of drop. 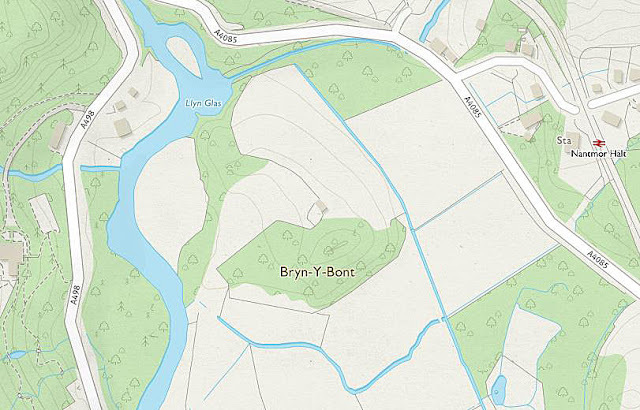 The name of the hill is Bryn y Bont and it is situated in the Moelwynion range of hills and is placed in the Region of North Wales (Region A, Sub-Region A1). The hill is positioned with the A 4085 road to its north and its east and the A 498 road to its west, and has the Afon Glaslyn also to its immediate west, with the hamlet of Nantmor positioned to the east of the hill and the village of Beddgelert towards its north. As the hill is not a part of designated open access land permission to visit should be sought, for those wishing to do so an ascent from the convenience of the road to its north or east is likely to be the easiest. Prior to analysis of data produced via LIDAR this hill was not listed in the Hills to be surveyed sub list that accompanied the Welsh P30 lists published on Geoff Crowder’s v-g.me website. When these lists were re-evaluated after they were standardised and also drop values added, this hill was listed with c 16m of drop based on an estimated c 20m summit height which was based on this hill’s small uppermost 20m ring contour on Ordnance Survey 1:50,000 Landranger and 1:25,000 Explorer maps, and an estimated bwlch height of c 4m based on bwlch contouring at 10m intervals and between 0 – 10m, with the caveat that the 4m spot height positioned at SH 59756 45814 and shown on the Ordnance Survey 1:25,000 Explorer map is probably not at the position of the critical bwlch. However, since these lists were re-evaluated OS Maps (the recent replacement for OS Get-a-map) are now available and show 5m contour intervals with an uppermost 25m ring contour for this hill. The term Significant Height Revisions applies to any listed hill whose Ordnance Survey or Harvey map summit spot height has a 2m or more discrepancy when compared to the survey result produced by the Trimble GeoXH 6000 or analysis of data produced via LIDAR, also included are hills whose summit map data is missing an uppermost ring contour when compared to the data produced by the Trimble or by LIDAR, and also hill’s that do not possess a summit spot height and whose estimated summit height has a 2m or more discrepancy when compared to data produced either by the Trimble or by LIDAR. As heights on different scaled Ordnance Survey maps are not consistent the height given on the 1:25,000 Explorer map is being prioritised in favour of the 1:50,000 Landranger map for detailing these revisions. Therefore, this hill’s new summit height is 25.2m and this was produced from data via LIDAR, this is 5.2m higher than its previously listed estimated height of c 20m which was based on the small uppermost 20m ring contour on the Ordnance Survey 1:25,000 Explorer map.